WASHINGTON (AP) — Emboldened by their new majority, Democrats are undertaking several broad new investigations into President Donald Trump and setting the stage for a post-Robert Mueller world. Whether the special counsel’s final Russia report is damning of the president or not, Democrats in charge of a half-dozen House committees are planning to flood the administration with document requests, calls for testimony and even subpoenas if necessary. The investigations reach far beyond Mueller’s focus of Russian interference and collusion in the 2016 campaign. The Democratic efforts increased this past week after Trump’s former personal lawyer, Michael Cohen, appeared before two House committees and a Senate committee. In his public testimony before the House Oversight and Reform Committee, Cohen called the president a “con man” and a “cheat” and gave Democrats several new leads for inquiry. The stepped-up oversight could eventually lead to, or even serve in place of, impeachment proceedings. While many liberal members of the Democratic caucus think impeachment is warranted, Democratic leaders have been cautious, saying they first want to investigate. The committee is reopening and expanding an investigation into Russian interference in the 2016 election that the Republican majority closed last year. At that time, Republicans said, over Democratic objections, that there was no evidence to show that Trump’s campaign colluded or conspired with Russia. The top Democrat on the committee then, California Rep. Adam Schiff, said Republicans had prematurely closed the matter without interviewing key witnesses and demanding important documents. Schiff is now chairman, and last month he announced a broad new investigation looking not only at Russian interference but also at Trump’s foreign financial interests. Schiff said the investigation will include “the scope and scale” of Russian intervention in the 2016 presidential election, the “extent of any links and/or coordination” between Russians and Trump’s associates, whether foreign actors have sought to hold leverage over Trump or his family and associates, and whether anyone has sought to obstruct any of the relevant investigations. The committee interviewed Cohen in private on Thursday and will finish the interview this coming Wednesday. After Cohen left, Schiff announced that the committee will hold an open hearing later this month with Felix Sater, a Russia-born executive who worked with Cohen on an ultimately unsuccessful deal to build a Trump Tower in Moscow. This committee was in the spotlight when Cohen testified publicly last Wednesday. 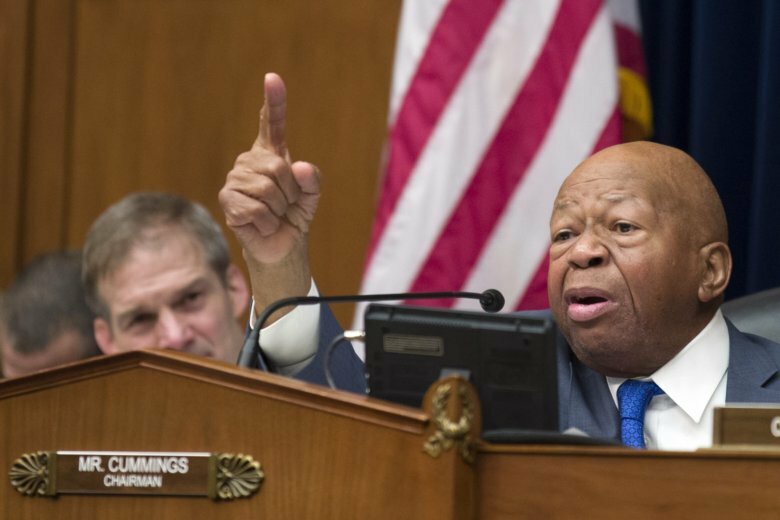 The chairman, Maryland Rep. Elijah Cummings, said afterward that he wanted to call in several people mentioned repeatedly by Cohen. That could include Trump Organization chief financial officer Allen Weisselberg and possibly two of Trump’s children, Donald Trump Jr. and Ivanka Trump. The committee’s jurisdiction touches on all parts of government. On Friday, Cummings demanded that the White House turn over documents by Monday related to security clearances after The New York Times reported that the president ordered officials to grant his son-in-law Jared Kushner’s clearance over the objections of security officials. Last Tuesday, the committee voted to subpoena administration officials over family separations at the southern border. The committee is also looking into other conflict of interest issues within the administration, including at Trump’s hotel in Washington, and into prescription drug prices. The House Judiciary Committee would be in charge of impeachment, but the chairman, New York Rep. Jerrold Nadler, first wants to examine Mueller’s report, whenever it comes out. Nadler has helped lead the charge to pressure the Justice Department to release the full report to the public. On Sunday, Nadler announced that the committee will request documents Monday from more than 60 people from President Donald Trump’s administration, family and business as it begins investigations. He said that would include officials from the Justice Department, Weisselberg of the Trump Organization and Donald Trump Jr. The committee has also called in the former acting attorney general, Matthew Whitaker, and plans to question him again in the coming weeks. Whitaker is a close Trump ally who had criticized the Mueller report before he was appointed. William Barr has since been confirmed as attorney general. The chairman, Massachusetts Rep. Richard Neal, is expected to eventually try to obtain Trump’s tax returns, which the president has refused to release. But for now, Neal is taking it slow. The law says the treasury chief “shall furnish” the requested information to members of the committee for them to examine behind closed doors. But reality is more complicated, and the request could end up in a lengthy court battle between Congress and the administration. Last month, Neal held a hearing in which experts discussed the authority under current law for Neal to make a request for any tax returns to the treasury secretary. The hearing also examined proposals to compel presidents and presidential candidates to make years of their tax returns public. The committee’s head, California Rep. Maxine Waters, has focused on Deutsche Bank, the German asset management firm that has loaned Trump’s real estate organization millions of dollars over the years. She said this past week that the bank is cooperating with requests for documents. The committee is working with Schiff, who along with Waters has said he wants to investigate whether Russians used laundered money for transactions with the Trump Organization. Trump’s businesses have benefited from Russian investment over the years, and Schiff has said he wants to know whether “this is the leverage that the Russians have” over Trump. Waters said she is also interested in looking at Trump’s embattled charitable foundation that is shutting down after agreeing to a court-supervised process and at White House budget director Mick Mulvaney’s tenure at the Consumer Financial Protection Bureau. She has said Mulvaney may be called to testify. The chairman, New York Rep. Eliot Engel, is also working with Schiff and his committee to review Trump’s encounters with and connections to Russian President Vladimir Putin, including a private meeting between the two in Helsinki last year. Trump would not disclose the full details of what was said in their meeting. The two committees have worked with House lawyers to figure out the appropriate way to investigate that meeting. That could include getting information from a translator who attended. The committee is also looking at the administration’s policy toward Saudi Arabia and response to the murder of journalist Jamal Khashoggi.